In the previous part, we saw how to instruction set works and how the different pins fit together to make the GLCD work. In this part, we’ll pick a particular microcontroller and try to work out how to configure the pins. The JHD12864E works in a parallel mode. By parallel, I mean that the data is passed in one shot which is by the data pins D0-D7 on the display. There are other GLCDs which pass data in serial i.e. one instruction at a time. In this case, we don’t need so many pins but there will be other considerations that we will need to … uh … consider. The GLCD has a 128×64 resolution. This equals about 8192 individual pixels that you can control as you wish. But how is this done? Let’s see how we reach a particular pixel on the screen. 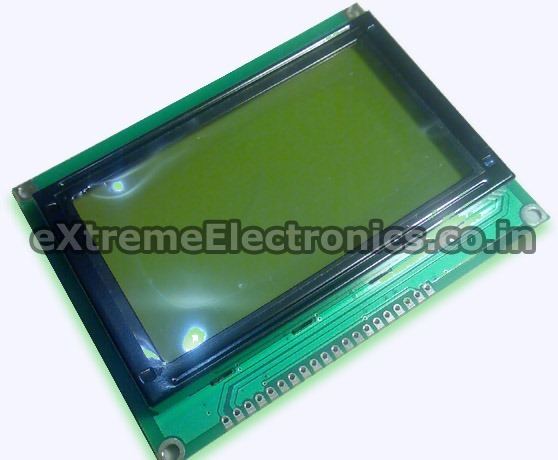 The LCD screen is actually divided into 2 halves with one KS0108 IC for each half. Each KS0108 IC has the ability to control 64×64 pixels, so both of them side-by-side should be able to give you the complete resolution of 128×64. So, by choosing which one of the two ICs, you can narrow your pixel down to one of the two halves.